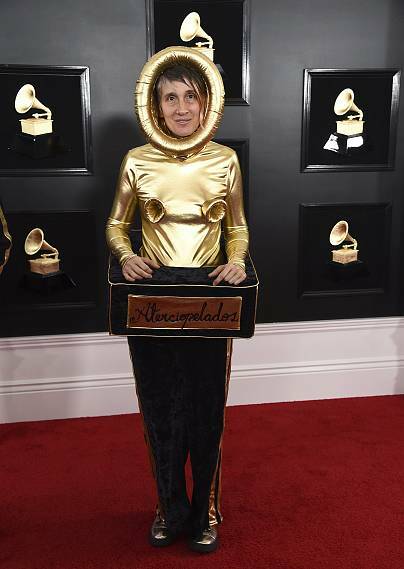 When it comes to having fun at an awards show, the Grammys wins every time. 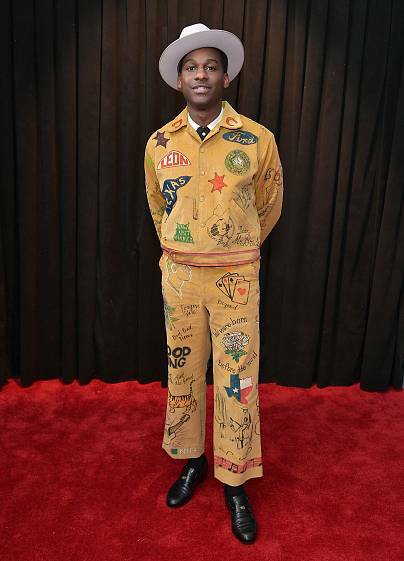 Besides the live music performances, the wild, wacky looks on the red carpet make the night a fashion extravaganza. 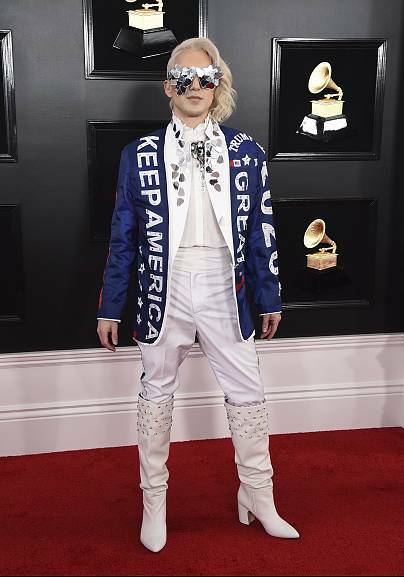 Whether they're playing with volume, wearing every color of the rainbow or making a political statement, these are the most-talked-about looks from the Grammys red carpet. Talk about a showstopper! 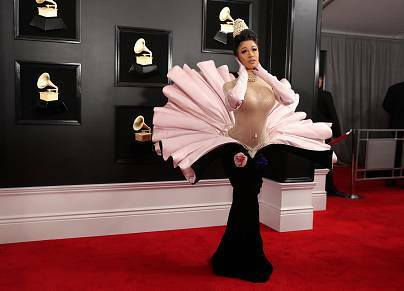 Covered in pearls and peaking out of a shell-shaped dress, Cardi B set the internet ablaze with this look — which people have compared with everything from an oyster to Ursula from "The Little Mermaid" to "The Birth of Venus" painting. 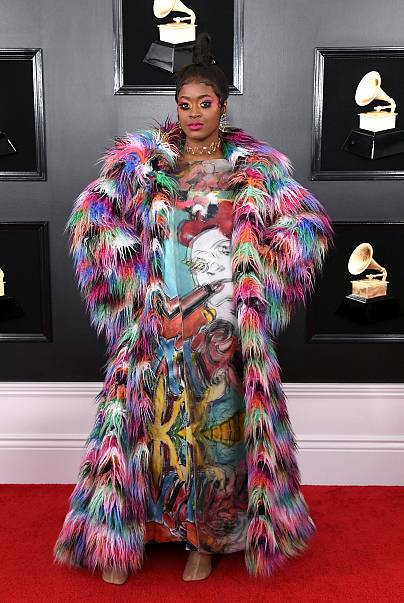 The Grammy-nominated artist went for a psychedelic look in an illustrated dress and floor-length, rainbow fur coat. Now that's one way to make an entrance! 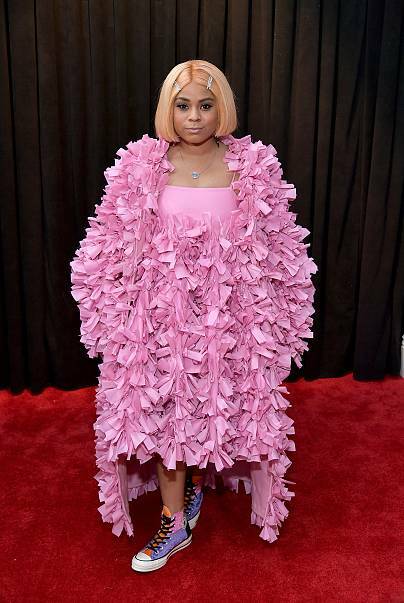 The singer-songwriter, who is credited as a co-writer on hits including Ariana Grande's "Thank U, Next," wasn't afraid to pair a textured pink dress and coat with fun and colorful sneakers. That seems like a smart (and comfortable!) move. J.Lo and A-Rod are always dressed to impressed, and the superstar couple were clearly into the fun-loving theme of the night. Lopez topped off her jewel-encrusted column dress with a dramatic, wide-brimmed hat while Rodriguez chose a blazer with a particularly eye-catching pattern. 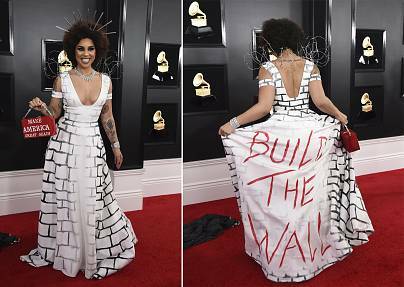 The singer-songwriter has used fashion to express her political views in the past — and this year's Grammys were no different. She even wore barbed wire across her shoulders! They say dress for the job you want ... but does that include the award you want? Colombian rock star Andrea Echeverri seems to think so! 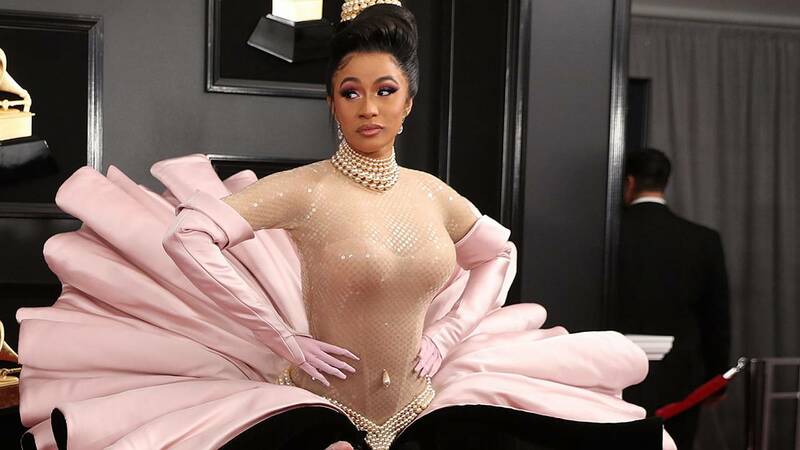 The pop star's structured gown got plenty of comparisons on social media — from Barbie cakes to jellyfish — we couldn't help but think of cotton candy! One especially nice part of awards shows is letting the people behind the scenes have their moment in the spotlight. 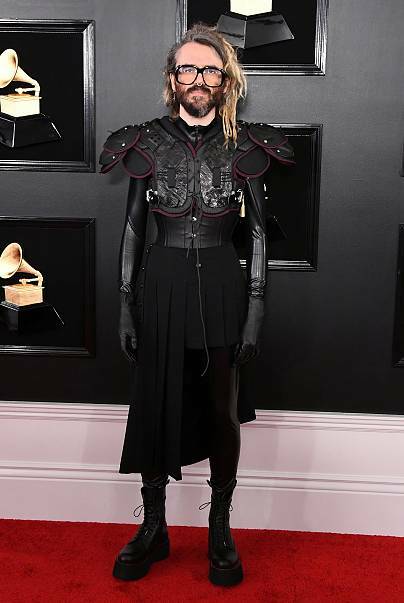 Shawn Everett, a music engineer and producer for bands like The War on Drugs and Alabama Shakes, went with a look that could be a football player in "The Matrix." Decked out in a light pink shade sometimes referred to as "millennial pink," Kylie Jenner went with a funky look while supporting Travis Scott (father to her 1-year-old daughter, Stormi Webster). Pop star Saint Heart went with a butterfly theme that certainly caught our attention! The fun pop of color was an automatic red carpet winner. It should come as no surprise that Cardi B's younger sister shares the fashionable gene! This barely there minidress has the voluminous sleeves that other dresses can only dream of. Is anyone else sensing a pink theme? 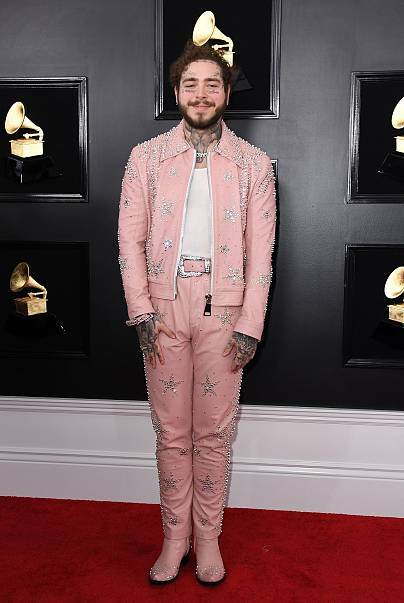 The rapper and producer took this Western-inspired outfit to the next level with a pale pink color and silver studs. 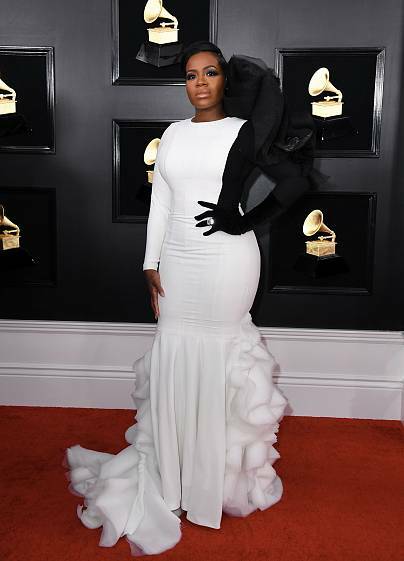 "American Idol" winner Fantasia Barrino went with a yin-and-yang theme in this half-gloved, black-and-white look.